A fantastic show of song and dance. 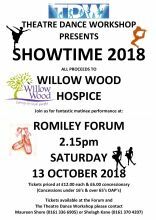 Once more, our thanks to the fantastic Theatre Dance Workshop who are performing a wonderful show of song and dance in aid of Willow Wood. This matinee performance is at Romiley Forum on Saturday 13 October and will start at 2.15pm. Tickets are priced at £12 each, or £6 for concessions (under 16 and over 65). Tickets are available at the Forum itself, from the Theatre Dance Workshop or by ringing Maureen Shore on 0161 336 6905 or Shelagh Kane on 0161 370 4207.